God is very childlike. He plays in everyone's heart. Fearlessly, He goes wherever He likes. Everyone is unhappy despite the existence of the Perfect God within each and everyone, because mankind has forgotten God within and worships an imaginary God outside. In the name of devotion, people think only of pleasures, because they have neglected the Truth and are trapped in the controversy of external mantras, tantras, worship and scriptures. Just take the example of India. There are two major religions - Hinduism and Islam. Hindus think wearing a topknot, sacred thread and forehead markings is their religion, while Muslims think themselves very religious if they shave off topknots, do not wear sacred threads, and do not paint their foreheads. Hindus consider cow-protection to be part of their religion, but it is not part of the Muslim religion. Is it possible that in the same country, at the same time, in the same place, two contrary actions can denote religion? But today people have rejected the one real religion and succumbed to selfishness. Both communities are engaged in wrong actions like eating flesh, drinking, adultery, theft, exploitation, bloodshed, profiteering etc. If the ruler and the ruled do not do their duty right now, they will have to suffer the consequences. When injustice prevails, both the leaders and the public have to suffer. "Under the rule of an unjust king, both vegetables and pastries are available at a penny a pound." A Guru and disciple once reached a city where an unjust king ruled. In that city everything was sold at a penny a pound. They camped outside the city near a lake. The Guru gave the disciple some money and told him to buy something to eat. The disciple went to a grocer's shop and asked the price of flour. The shopkeeper told him that everything in the shop sold for one penny a pound. The disciple thought he was joking. Then he went to a greengrocer's and came to know that every vegetable was available at one penny per pound. This made him very happy. He decided that it would be a good place to live as every sweet too was sold at one penny per pound. He thought to himself, 'I would not even think of leaving this place. I will eat a lot of dairy foods and get very healthy. This is the best place in the world!' He bought some food and returned to the Guru, who asked him why he was so late returning. He replied, "Gurudev, it is very nice here. Everything is a penny a pound." When the Guru heard this, he said at once, "My son, throw this food away and let us leave immediately. It is not advisable to stay here even a second, because justice cannot prevail where everything is sold so cheaply and one should not stay where there is no justice." Although he tried to convince the disciple, he did not succeed. So he left alone. The disciple stayed on and got fat eating sweets and dairy products. After some time, the wall of a merchant's house collapsed and killed his neighbour's goat. The neighbour approached the king seeking retribution. The king summoned the merchant and sentenced him to death. The merchant pleaded, "It is not my fault. The mason who did not build the wall properly is to be blamed." The king called the mason and asked him the reason for his negligence. The mason said that his labourer had made the mud too watery so the wall was not firm. The king called the labourer and asked him why he had done this. The labourer replied that the man who poured in the water had poured too much and that was why the mud was too soft. The ruler called the water-pourer and asked why he had poured so much water. He replied, "The water-bag was big that water poured out too quickly". The king called the man who had made the water-bag and asked him why the bag was so big. He replied that the goat whose skin was used to make the bag was too fat, so that was why the bag was too big. The king called the shepherd concerned and asked him why he had let the goats get so fat. The shepherd replied that due to heavy rainfall there was more grass, so the goats got fatter than usual. The ruler said, "It is all your fault. You let them graze too much. So I sentence you to death." The shepherd was sentenced to hang. But he was very thin and the noose could not be tightened around his neck. Then the king ordered that a fat man be found to be hanged in his place. The soldiers went throughout the city searching and happened to see that same disciple, who by now was very chubby. They brought him to the gallows. It is the rule that a condemned man be granted a last request. That disciple asked to be allowed to see his Guru for the last time. Fortunately, Guru Maharaj happened to be in that city and when he heard that his disciple was about to be hanged, he ran to the gallows. He told his disciple, "Do not worry, I will fix everything. Just say that you wish to be hanged and I will say the same." So they both started quarrelling. The ruler was astonished, because even courageous men do not want to die, yet these two were more than eager to die. When he asked the reason, the Guru said, "Sir, whoever hangs at this moment will go straight to heaven." When the king heard that, he pushed aside both of them and had himself hanged. With the death of that king, his unjust rule came to an end. When rulers are corrupt, the citizens also become corrupt. In other words, criminal thoughts take root in people's minds. When one cultivates holy thoughts he is called a saint and when one cultivates wicked thoughts he is called a demon. St. Tulsidas said, "When wickedness increases and, due to vanity and pride, negativity and injustice increases and the pious are persecuted, God manifests to relieve their misery." He then describes the sinful actions which are a burden on the earth: the wicked act contrary to spirituality in every way and persecute the good. Nobody respects saints. 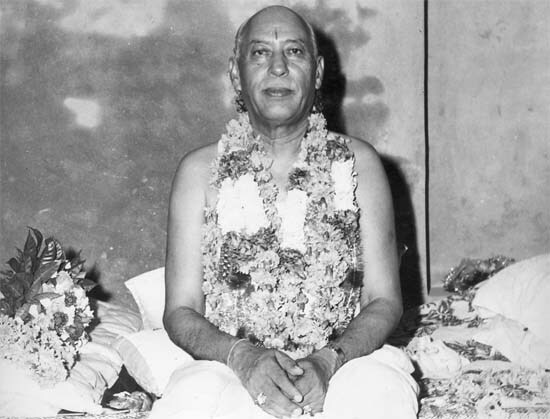 Knowledge and devotion are confined to scriptures. Thieves and gamblers abound. Men steal from their teachers. Moreover, they compel the saintly to serve them. Lord Shiva said that such people are in fact demonic. Lord Krishna also explained to Arjuna, "When spirituality declines and unrighteousness increases, I incarnate in every Age to revive spirituality, liberate devotees and destroy the wicked." Therefore, take benefit of such opportunities and realize the Spiritual Knowledge in your heart. downloaded from http://www.manavdharam.org/books_mags/online_magazines/md/2008/feb_08/hansji1.html on 1st April, 2009.